Never been humiliated by frequencies and you’re dying to know how it feels? 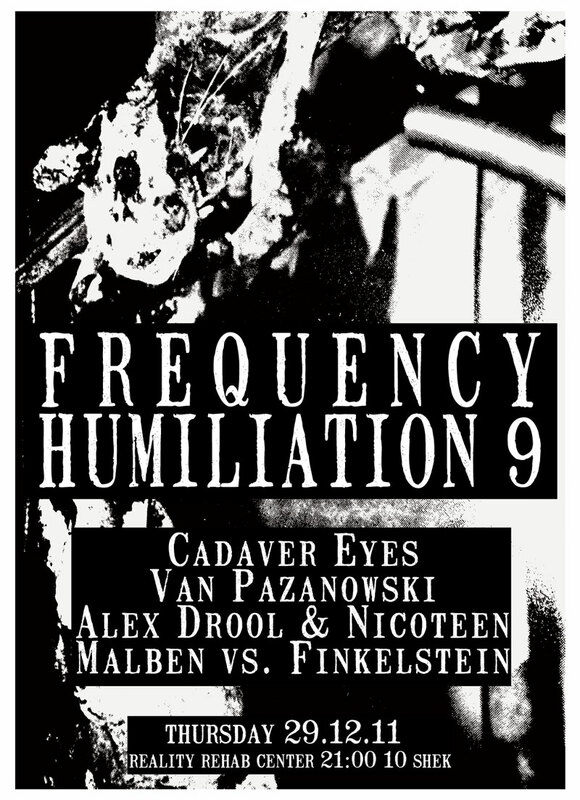 Next Thursday (December 29th), the sonic terrorists social club meets again for the 9th installment of Frequency Humiliation, just to let you know! This time, the venue changes to the supa’ cool Reality Rehab Center, and the line-up features the scariest microphone humpers in the Middle-East. Van Pazanowski — must end by 23:00, so we seriously intend to start performances at 21:00. Drool & Nicoteen will start after 23:00 and Tom Sveta will end this night playing a set of sweet calipso tunes for our bleeding ears. Reality Rehab Center, Beit Yossef 23 (under the Norman bar, not far from the Minzar), Tel-Aviv. 10 shekels. Thursday, December 29, starting at 21:00 sharp.